Cherokee Chief Stand Watie exhibited bravery and leadership while fighting for two lost causes. So who was Chief Watie? Was he infamous or famous? We will explore the history of legendary Stand Watie and then you decide. Always a clear-thinking man, even on a day when kinsmen were murdered and vengeful fellow Cherokees dogged his heels, Stand Watie knew that he had to maintain a straight face and stay calm if he wanted to remain alive. The son of an old friend had ridden from one of three murder scenes and brought him a warning. The youth remained collected and spoke calmly with Watie, who was inside a small store he kept in northeastern Indian Territory. Knowing that enemies could be listening, the young man bargained loudly for sugar and softly told Watie what had happened and where to find the horse called Comet standing bridled and ready. Deliberately, Watie left the store and rode off safely. He would remain in jeopardy for almost six years. The murders, which took place on the morning of June 22, 1839, pushed Watie into the leadership of a small and unpopular Cherokee faction for the rest of his life. The tribal majority blamed Watie and his faction for the removal of the Cherokees along what became known as the Trail of Tears. Watie's uncle, the prominent chief Major Ridge, Watie's cousin John Ridge and Watie's brother Elias Boudinot (also known as Buck Watie) all died that day in the new Cherokee Nation in the West. Stand Watie faced few worse days in his adventurous and violent life that saw him become a Confederate brigadier general. On the losing side twice in his life, he had intimate familiarity with dashed hopes and lost causes. The Cherokees, linguistic kinsmen of the Iroquois, numbered about 30,000 in 1605 and lived in what is now Georgia, Tennessee and western North Carolina. Smallpox and other diseases struck often in the 1700s. By 1800, the Cherokee population was probably about 16,000. In the Georgia Compact of 1802, Georgia gave up the land that became Alabama and Mississippi with the understanding that the federal government would force the Cherokees west. The Cherokees refused, and Washington stalled. Most of the tribe decided that assimilation gave them the best hope to stay in their homeland. Cherokees began to take on white ways, seeking education, material profit and cultural interchange. Assimilation, though, didn't work as planned. Growing economic power on the part of the Cherokees enraged white Georgians, who redoubled expulsion efforts. To some natives the solution was obvious, and one-third of the tribe had moved west of the Mississippi River by 1820. They were eventually pushed all the way to what would become Oklahoma. The bulk of the tribe went to court, and the debate over relocation simmered. Meanwhile, the tribe (which numbered about 14,000 in the Southeast in the mid-1820s) began to suffer a debilitating internal split. Perhaps 20 percent of the Cherokee people successfully adapted to white lifestyles, some becoming affluent Southern slave-owning planters. Among the most prominent slave-owning Cherokee aristocrats were the Watie and Ridge families. The faction of the tribe headed by the Ridges and Waties owned most of the estimated 1,600 slaves held by tribesmen. Cherokee slave owners tended to work side by side with their chattels, children were born free, and intermarriage was not forbidden. Only about 8 percent of tribal members (1 percent of full-blooded families) actually owned slaves. Because of the influence of mission schools, many Cherokees were intensely anti-slavery. Poorer than the Ridge-Watie faction, the traditionalists had neither the money nor the inclination to move West. In 1827, the Cherokees created their first central government to better deal with the white world. At a convention the next year, John Ross was elected principal chief--a post he held until his death in 1866. Ross, born in 1796 in Tennessee, was mostly Scottish, having only one-eighth Cherokee blood. But he was Cherokee to the core and enormously popular. His rivals turned out to be the sons of old-time full bloods. Major Ridge and his brother, David Watie (or Oowatie), were descended from warrior chiefs. Both men married genteel white women and rose in society, dressing and acting like planters. The family was close, and family members wrote more often and better than most whites of the time. Some 2,000 family letters were found in 1919. Following Sequoyah's development of a syllabary in 1821, Cherokees took enthusiastically to reading and writing. When Stand Watie began writing is not certain, but his only surviving letters date to the Civil War. Stand Watie was born in Georgia, probably in 1806; his early life is obscure. He was educated at a mission school, but less thoroughly than his brother Elias Boudinot, who was born Buck Watie but took the name of a white benefactor. Elias became a newspaper editor, and Stand held the job briefly during his brother's absence. 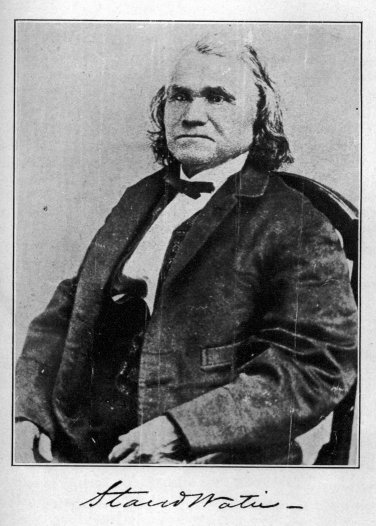 Stand Watie married several times, losing a number of wives and children to disease. The family did not record dates and details. Watie's rivalry with John Ross, whose bywords were unity and opposition to removal, slowly began to grow after 1832. Most of the Cherokees who had not moved West in the removal treaties of 1817 and 1819 continued to be against relocation, and Ross was their spokesman. The Ridge faction thought relocation to be in the best interests of the people. Major Ridge, a full-blooded Cherokee, and his son John Ridge felt that the educated and wealthy Cherokees could probably survive in Georgia but that the others would be led into drunkenness and then cheated and oppressed. War would be the inevitable result. Each faction thought the other was corrupt. The Ridge-Watie party allied itself with U.S. President Andrew Jackson and his supporters, and connived behind the backs of the Cherokee councilmen, who usually opposed them. The atmosphere became poisonous as rival Cherokee delegations went to Washington, D.C., with different plans, and President Jackson played both sides against each other--fostering allegations of bribe-taking. In 1835 the issue came to a head. Ridge's faction helped draft a treaty that would require Cherokee removal west of the Mississippi in return for about $5 million. Ross and the council rejected the treaty, holding out for $20 million and other terms; they would not move on Ridge-Watie terms. By October it was clear that most Cherokees sided with Ross. It was also clear that the government would not pay $20 million. Then, in December 1835, the Ridge-Watie party committed what amounted to suicide. Major Ridge, John Ridge and the Watie brothers were the only prominent Cherokees to sign the Treaty of New Echota, in Georgia, on December 29. A free-blanket offer attracted some 300 to 500 people--probably 3 percent of the tribe--to the signing place. Only about 80 to 100 people eligible to vote were present. Ross and the legitimate council were nowhere near. The treaty was roundly denounced--even by such unlikely allies as Davy Crockett and Daniel Webster. Cherokees in the East had to leave the Southeast in return for a payment of $15 million and 800,000 acres in Indian Territory (in what would become northeastern Oklahoma and part of Kansas). The Cherokees were to be removed within two years. The Ridge-Watie faction ("treaty party") thought the terms generous--that they had gotten a good price. Whether or not the terms were generous, the treaty was a disgrace, as it was opposed by some 90 percent of the tribe. The U.S. Supreme Court ruled the treaty invalid, but President Jackson refused to void it. The Martin van Buren administration did likewise. Ross and his "anti-treaty party" fought a losing court battle, and they were not well-prepared for removal when it began. In 1837, only about 2,000 Cherokees went West; most of the others held out, perhaps not believing they would be forced to leave their homeland. The so-called Trail of Tears (the Cherokees called it Nunna daul Tsuny, "Trail Where We Cried") came in 1838, when Federal troops and Georgia militia removed the holdout tribe members to Indian Territory (about 1,000 avoided capture by hiding in the mountains). As many as 4,000 Cherokees may have died from disease, hunger, cold and deliberate brutality by volunteer Georgia troops and regulars led by a reluctant General Winfield Scott. The Ridge-Watie parties had been among the first to depart to the new country, arriving in 1837. They had gone in comfort and had located themselves on choice Indian Territory land. Because most of the Cherokees who followed suffered during the migration and after their arrival in the West, resentment against the Ridges and Waties grew. Historians disagree about the level of brutality on the Trail of Tears, but most historians agree the suffering and death continued in the West, mainly because of epidemic diseases. And historians also agree that the treaty was invalid, the military high-handed, the preparations and logistics inefficient, and the intent rapacious. The Cherokees certainly thought so, and feelings against the treaty party ran higher and higher. Ironically, Major Ridge himself had helped write the death penalty into the Cherokee Constitution for those selling tribal land without authorization. Many years earlier, he had killed a fellow chief named Doublehead who was convicted by the tribal council of such a land deal. Clearly, Ridge knew the penalty. More than 100 members of the anti-treaty party met at Double Springs on June 21 and pronounced death sentences in secret--outside the council and without vested authority--purportedly to keep John Ross from finding out about their plans. Either Ross had reached the end of his patience with his enemies--or he simply could do nothing to stop the killings. Death came early and with ritual touches for John Ridge at his Indian Territory home on Honey Creek, near the northwest corner of Arkansas. About 30 killers dragged him from his bed and into his front yard around dawn on June 22. They knifed him repeatedly before his distraught family. Old Major Ridge, John's father, was ambushed a few hours later while riding past a small bluff on the road to Washington County, Ark. Rifle-toting bushwhackers opened fire, hitting him five times. Boudinot, at about the same time, was going about his daily work, helping a friend build a house near Park Hill, some miles from John Ridge's house. Three Cherokees approached him and told him they needed to get medicine. Because Boudinot's tribal responsibilities included providing medicine, he followed, unsuspecting. One of the men quickly dropped behind him and stabbed him in the back. Another axed him in the head. Boudinot's brother, Stand Watie, was also apparently marked for death that day. But Boudinot's cries on being stabbed were heard by friends. The youth who delivered the warning to Watie was probably the son of the Reverend S.A. Worcester, a family friend. Watie's store was close to John Ridge's home. Because John Ross was proud of his ties to the average Cherokee and was very popular among them, he was in a difficult position. He repudiated the murders, but he did not turn the killers in and may actually have hidden some of them. He denied complicity and does not appear to have been directly involved. Former President Jackson wrote to Watie and condemned "the outrageous and tyrannical conduct of John Ross and his self-created council....I trust the President will not hesitate to employ all his rightfull [sic] power to protect you and your party from the tyranny and murderous schemes of John Ross." Jackson didn't curb his habit of speaking from both sides of his mouth. He urged Watie to make peace but endorsed seeking vengeance if Watie didn't get what he wanted. Watie formed a band of warriors, and Ross complained to Washington that he had to go armed among friends. The government ordered Watie to disband his followers, to little avail. Until 1846 the Cherokees were involved in a murderous internal feud. As chief of his segment of the tribe, Watie authorized retaliation, and vengeance murders were common. Legend has encrusted Watie's activities, giving him heroic courage and coolness and deadly fighting skills. His most documented exploit occurred in an Arkansas grocery where he confronted James Foreman, an alleged killer of Major Ridge. The two men had threatened each other frequently, but this day they bought each other a drink. A challenge was quickly issued, and the drinks were hurled aside. Foreman had a big whip, which he used against Watie. Watie stabbed Foreman when Foreman tried to hit him with a board. He then shot and killed the escaping Foreman. Watie successfully argued self-defense at his trial. The tribal situation was brutal. In one letter to Watie, a relative recounted family news that included four treaty-related killings (and two scalpings), three hangings for previous killings and two kidnappings. The letter said that intertribal murders were so common "the people care as little about hearing these things as they would hear of the death of a common dog." The Cherokees made internal peace in 1846--Watie and Ross reputedly shaking hands--and sought to rebuild tribal prosperity in the West. Times were improving until the Civil War. Stand Watie was a member of the Cherokee Tribal Council from 1845 to 1861. He declared his support for the Confederacy early on, but Ross resisted at first. The Confederacy was successful in seeking alliances with Comanches, Seminoles, Osages, Chickasaws, Choctaws and Creeks. Ross was finally forced into the Confederate alliance. Watie raised a cavalry regiment and served the South with distinction and enthusiasm. Another Cherokee regiment served under John Drew. In all, about 3,000 Cherokee men served the Confederacy during the war. Watie was beloved by die-hard Confederates. Judge James M. Keyes of Pryor, Okla., said: "I regard General Stand Watie as one of the bravest and most capable men, and the foremost soldier ever produced by the North American Indians. He was wise in council and courageous in action." Watie fought most of the war at the head of a band of very irregular cavalry. He led with dash and imagination as they ambushed trains, steamships and Union cavalry. He also fought in one major battle. On March 7-8, 1862, Watie was part of Confederate Maj. Gen. Earl Van Dorn's army of 16,000 men. They were in the region of Fayatteville, Ark., trying to encircle the right flank of Maj. Gen. Samuel R. Curtis' 12,000-man army. Curtis, who was on the defensive about 30 miles northeast of Fayatteville at Pea Ridge, discovered the plan and spoiled the offensive. Van Dorn withdrew after two days of stubborn fighting, but Pea Ridge cemented Watie's reputation. He captured a Union battery after a dramatic charge, and also proved skillful in withdrawal, helping to prevent a disaster. One of his soldiers said: "I don't know how we did it but Watie gave the order, which he always led, and his men could follow him into the very jaws of death. The Indian Rebel Yell was given and we fought like tigers three to one. It must have been that mysterious power of Stand Watie that led us on to make the capture against such odds." After the Battle of Pea Ridge, Drew's regiment deserted the Confederacy. Watie, though, stuck to the Southern cause. Untrained as a soldier, he had good sense and cunning and was an effective guerrilla. "Stand Watie and his men, with the Confederate Creeks and others, scoured the country at will, destroying or carrying off everything belonging to the loyal Cherokee," wrote 19th-century anthropologist James Mooney. Watie was promoted to brigadier general on May 10, 1864, and on June 23, 1865, was the last Southern general to capitulate. Watie returned to absolute devastation. (According to Mooney, the Cherokee population during the war was reduced from 21,000 to 14,000.) Watie then fought some losing postwar battles. He was rebuffed in his bid for federal recognition as Cherokee chief and was also rebuffed in efforts to rebuild his fortunes. Watie's last years were careworn as his family dropped around him. All his sons died before he died on September 9, 1871, and his two young daughters followed in 1873. But Confederate veterans and sympathetic writers kept Watie's legend alive. He became the example of devotion to "the Cause." Even enemy Cherokees came to respect his devotion to his beliefs, and "Stand" and "Watie" became common Cherokee first names. Watie had displayed unfailing courage, devotion, constant optimism and good humor--at least according to his friends. He never, they say, had a harsh word for his family and never gave way to despair or dejection. In reality he was not a shining cavalier--his Indian troops sometimes reverted to scalping and torture. He clearly was involved in shameful political skullduggery. But he was a man who fought hard for his beliefs and stuck to his guns even when the odds were against him. He had supported two lost causes--the Ridges and then the Confederacy--but he had never given up. 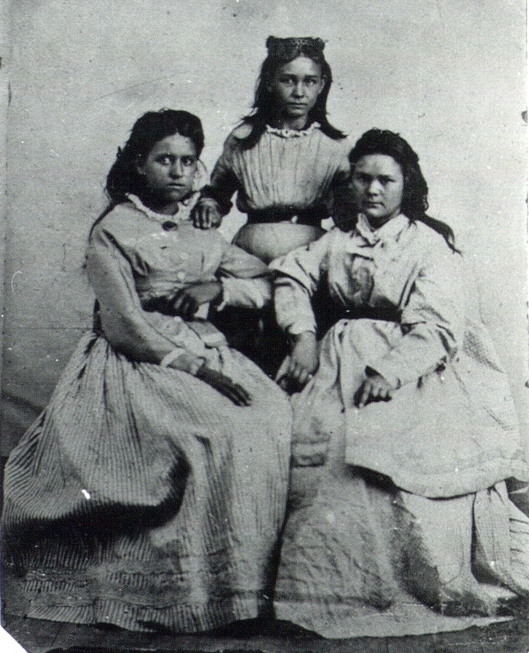 This article was written by Jim Stebinger and originally appeared in the October 1997 issue of Wild West; Stand Watie photo National Archives; photo of Daughters is Image #16978 in the Stand Watie Collection.